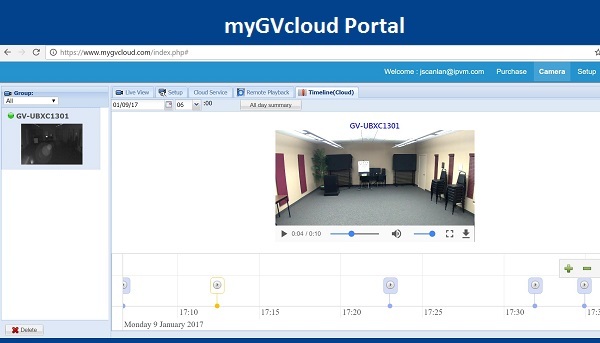 This is certainly not the first professional manufacturer to offer a cloud service (e.g., Axis has had AVHS for more than a decade) but Geovision has made it that consumers buy directly off the Geovision myGVcloud website. Indeed, we bought a $50 720p camera and tested out the service. **** ** ********* *** *** ***** ************ ************ ** ***** a ***** ******* (*. *., **** *** *** **** *** **** than * ******) *** ********* *** **** ** **** ********* buy ******** *** *** ********* ********* *******. ******, ** ****** a $** **** ****** *** ****** *** *** *******. ******** ** *** ****** *****, ********* *** **** ********** **** over *** **** *** ***** (******* ***** ** **** *********). ** *** **** * - * *****, *********'* ******* is ******* **** ** **** **** ******** ** *** ~$** million *****. ** *** ***** ****, **** *** *** ******* feeling ******** *** ******* *** **** ** **** ******** ******* of *** ****** ******** **** ** *** ******. ** *** **** ****, *** ******* *** *** ******* *** the ******* ** ********** *** / **********. *******, *** ******* **********, **** ***** *******, **** ********, ** real ******, ******* ***** ****** ** ** **** ********** *** limited ***** ********* ***** ** *** **** **********. **** ********* *** ******* **** **** ***, *** ***, ** do *** ****** ** ** ** * ****** ******** **** Geovision. *******, ******** *** **** ** ************** *** ** ********* long **** ** *** **** *** ****** ********** ************* ******* traditional ******* / *********. ********* ** **** * ****** ** *** ******* **** ********* offers *** *** ***** *** ** ********* ******* ** ***** to *** *************** ** ***** *********** ***. ** **** ***, it ****** *** ****** ******** **** **** ********* *********** *** offering / ******* *****. *****-************* *** $** *** ****** (** ******). **** ******* ** ******* to *********'* ***** **** *****, *** **** * (~$** ******), but ************* **** ********* **** **** *** ***** ******, ********* $***-*** or ****, **** ** ******* ***. ********* ****** ***** ******, ** ****, ********* ******* ****** (~$***), **** (~$**), *** panoramic ******* ($***/$***). **** ** **** **** ******* ******* ** most ***** ****** *********, ****** ***** ******* ******** ** *********, which *************/***-***************** ** *** *****/***** **** ******* (********* ***, ****, ***, bullet, *********, ***.). ********* ************ ***** *** *********** ******, ** **** **** ** offering **** "********* ****", *** **** "* ****" (** * weeks ** * *****),**** **** "*** ******* **** (** ** ** ****)" — listed ** "********" ** *********'* ****** ********** "* ****" ** *** ******'* ***. ******* **** **** *** ** ***** ******* **** "*** ****", with *** ******* ******** **** ******* ** ** ****, *** otherwise ********* ** *** **** ** *** ****** ****** *** ********* of ****** ******. **** ***** ** *** ************ ***** *******, **** ********. ** the $*. ** *** ****, *** *******, ****** ***** **** *** camera *** * ****, ********** ** *** ***** *** ******'* stream **** **. ****** ********* *** ***** *** ******** ***** ******* *****, ** well, ***** *****. **** **** ********* ****** **** ***** ******* * ************ ** view **** *** ******** *****, ****** **** ** ******** ** the **** *** "************" *** **** *** ******* * **** plan. ********* ******** ***** ** *** ** ******* *** * ******* app (******* ** ***), **** ** ****** ** *** * mobile ***** *** *****, ****** *** **** ******** ** ***** cameras *********. ***** *** *****, ******** *** ***** ******* *** ********* cameras, ********* ** ****** ** *******, *** *** ********** ******* to **** *******. **** *********** *** ** ***** *********. ***** is * ****** **** ** *** ***** *******. **** ***** ** *** *******, ******* **** ******** *** ****** the ********* *** ****** ** ****** ***, ******** *****. * ****** ****** *** ** ******, ******* **** ********** *******, such ** ******* ****, ********, ********, *** ***-*** ***** ********. ******** ** ******* ** *** ******, **** ***** ****** ****** chronologically, **** ** ***** ****** *********. ************, ***** ** ** export. *** ********* *** ****** ** **** ******* **** *** ****** app *** **** ****, ** **** * ****** ****** *** be ****** ** ****. *******, ******** ** ***** ********** ** ********* ** * ******* timeline, ****** **** ******** ****** ******** *****' ******** ** *** timeline, *** ****** ** ******** ******* — *** ******** ********* is ********* **********. ** ** *** ****** ***, ** ****** of ***** ********** ** ********, *** ***** *** ******** ***** from *** ******'* ** ****. ************, *** *** ****** *** ** **** ** ********* ******* camera ********, **** ** **********, *********, ********, ***, ***. *******, there ** ** *** ** ******** ******* ***********/*******. ****** *** *****, **** ******* **** *** ***** *** *** web ******, ***** *** *-** ****** *******. *******, *** ****** app *** *** ******* ******* ****** **** ****, **** ***** only ~*-* ******* *******. **** ******* ******** ********** ** ******** ***** ** ******* *************, ** it *** ****** ** ******** ******** ** ******* ***** *** fiber ***********, ** **** ** ***. ** **** *** *** ******** ***** *** ***** **** *********'* UBX1301 *** *** **** **** ********* ** **** ***** *** low *****. ***** ** *** **** *** ** *** ********** room ***** ******* *** *********. *** ***** *** ********* *** ************ ** **** *** ***-***** 1301 ** **** ** *** **** ** ***** ** *** ********** image *****. *** ********** ******* ** *** ***** *** ****** details *** **** **** ****** ********** ** *** ******* *** 2542 ******** ** *** ***** ***. *** ******** **** ********* ** *** *****. ** *** ********** below *** ******* ** **** ** ** ********, *** ******* are *** ************. *** ******* ** *** ***** *** *** legible.